The kids are in bed, you sit down on the couch, & you are surrounded by piles of toys. You are too tired to do anything about it, but you can’t fully relax b/c you feel a little guilty for not cleaning up. You sit down at your desk, ready to work, but you keep getting distracted by stray notes left on your desk. Your computer desktop isn’t any better, & you can’t find the files that you need when you need them. You are on a tight schedule, but you can’t ever seem to get anywhere on time. You feel like you should be better at this. You wonder how other people manage to get places on time. In each of those situations you are not being as efficient or as relaxed as you could be. Disorganization goes hand-in-hand with stress, but often we do not see how closely these two things are related. If we are used to living in a world of clutter and disorganization, we think that we have adapted to it. We think that we function just fine in the midst of it all, & we think that it would take more time & effort to get organized than to function in disarray. Dana Grossman Leeman, MSW, PhD of Simmons School of Social Work confirms that this is simply not true. It can be very difficult to keep your home organized if you simply have too much stuff scattered about. Decluttering & sorting through things initially will help you keep up with day to day organization. If there are things that you don’t want to get rid of, you can simply put them away in storage for now. Try to really limit how much you keep in your living space, & you will start to see the positive effects quickly. If you pack away the special cookware & servingware, you will have more room to store the kitchen items that you use daily. You can free up counter space & easily put things out of sight if your cabinets are not cluttered with items that you use once or twice a year. Imagine cooking meals in a clean kitchen where you have counter space to chop, prepare, & dish meals! Organizing the physical objects in your life is important, but organizing your time is the next major step. Planning out your time does take a little extra effort up-front; however, it quickly pays off when you are not rushing from activity to activity & missing deadlines or forgetting important details. Pay close attention to how much time certain tasks actually take you. Sometimes you will be surprised at how little time dreaded tasks take (like folding laundry), or you may be surprised at how much time you just spent scrolling through Instagram. Once you have a handle on how long different tasks take you, you can realistic plan out your days. Just don’t forget to leave room for those extra hiccups that always seem to occur just when you’re heading out the door. Imagine living in a world where you are not checking your car clock every few seconds worrying that you will be late. You can put yourself back in control of your day instead of feeling pulled in all different directions. You will be able to say yes to certain activities & politely decline others while being realistic about your time limits. Once you have other aspects of your life organized, you will find that your mind automatically becomes more clear. You will have space to brainstorm creative ideas, problem solve, and simply enjoy the moment that you are living at that current moment. You can continue to use other resources to empty out your brain – write lists, use smartphone apps, set alarms, use planners, etc. The goal is to get you to a state where you can enjoy the life that you have created for yourself. You work hard, & you deserve to be happy! 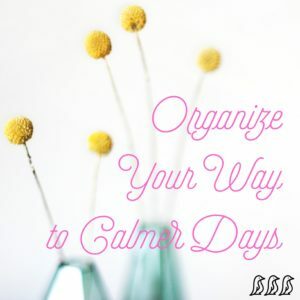 Take the time & energy to organize your life so that you & your family can enjoy the benefits of calmer days.